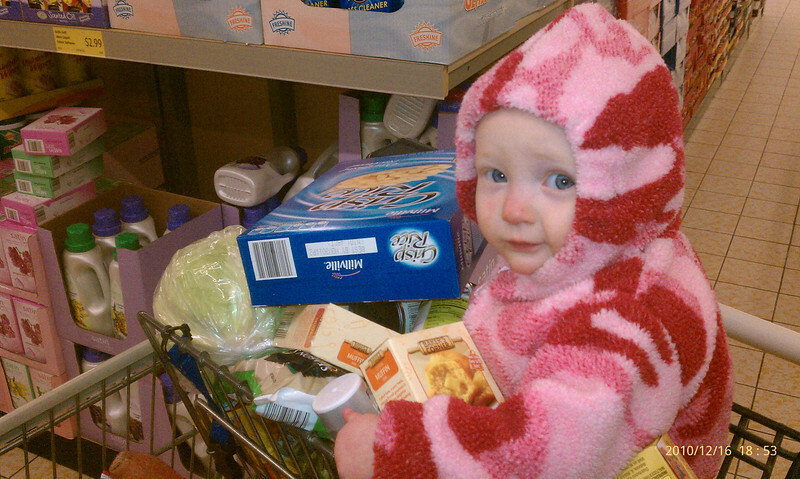 That picture is old but I never posted it and it is cuter then anything I took last night. Oh FYI we I broke our camera. 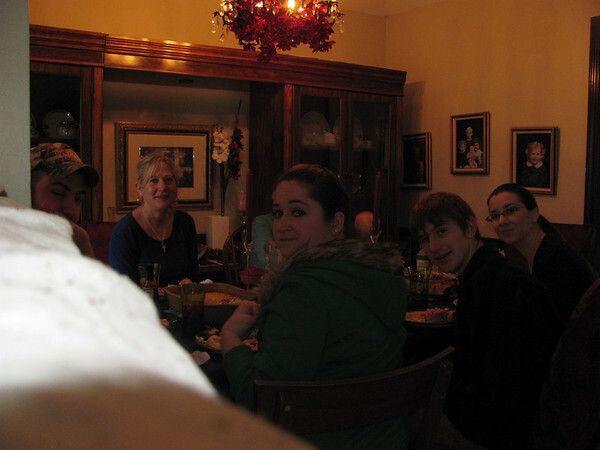 I was setting it up for a timed shot of our Christmas breakfast and it took a dive off a shelf with the lens open. This was the last thing it saw before smashing into the ground. So the lens is jacked and I have it all boxed up and ready for canon to fix or replace. We got it early July and it is still under warranty. We have some backup cameras but last night I just used my phone and the pictures don’t look great. I was starving on my drive home from work so once home I got busy on dinner. Heath was doing a bit of sewing and Pumpkin was sleeping in. 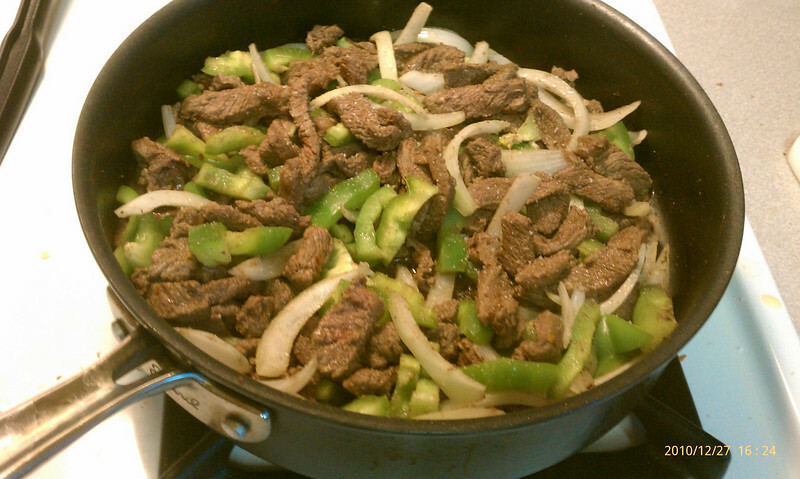 I thawed some deer steak then cut it up and fajitaed it. and then some fajita and then rolled them in the dish enchilada style. 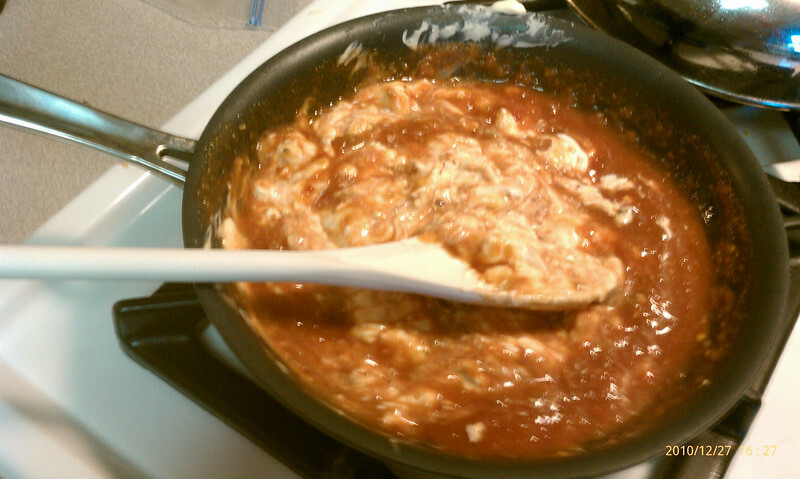 In another pan I mixed super blended salsa and cream cheese. 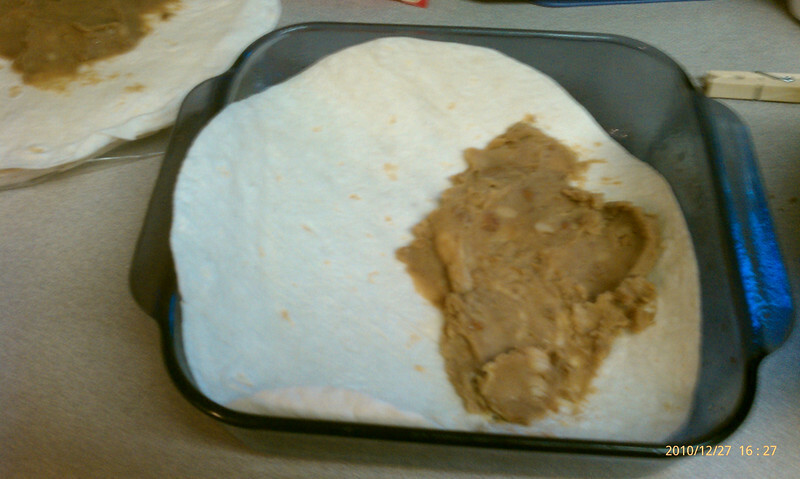 Once it was warm and mixed up good I covered the dish of fajita enchiladas and stuck it in the oven. 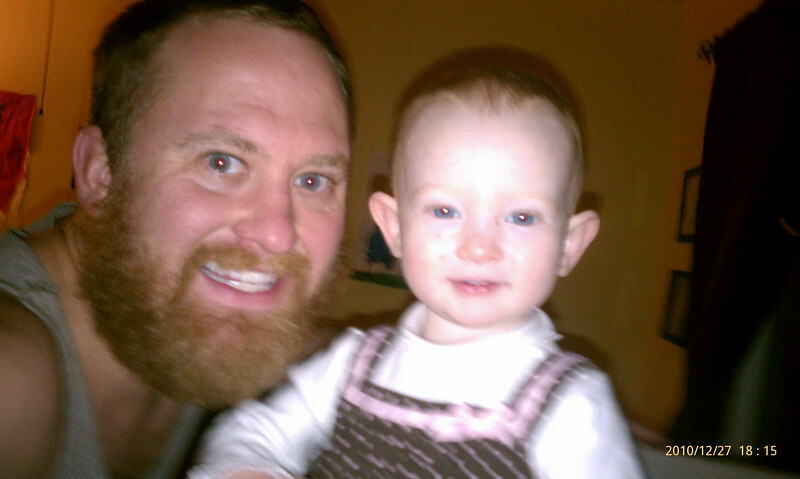 Heath and I got the baby up and watched some Dexter and fed Pumpkin. I took a break to cover everything in shredded cheese then let it cook 10 more minutes. We finished the show and the dinner w/ some tortilla chips. Then Heath took a shower and Pumpkin and I played on her house. 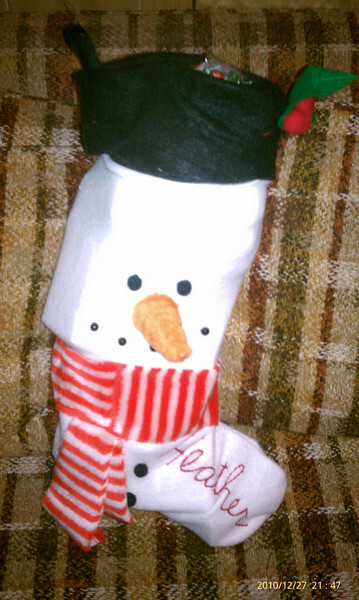 Once Heath was done the girls headed to another Christmas family gathering and I started breaking out the new toys. I was really eager to start brewing beer but I still need a giant pot to boil my wort in. Jon has a 4 gallon one I’ll need to borrow. So I saved beer for another night but broke out a couple of other toys. When brewing beer all the guides recommend you have a nice glass of beer while brewing. Last night was I blending and dehydrating so I started with a nice glass of fruit juice made entirely of whole fruits. 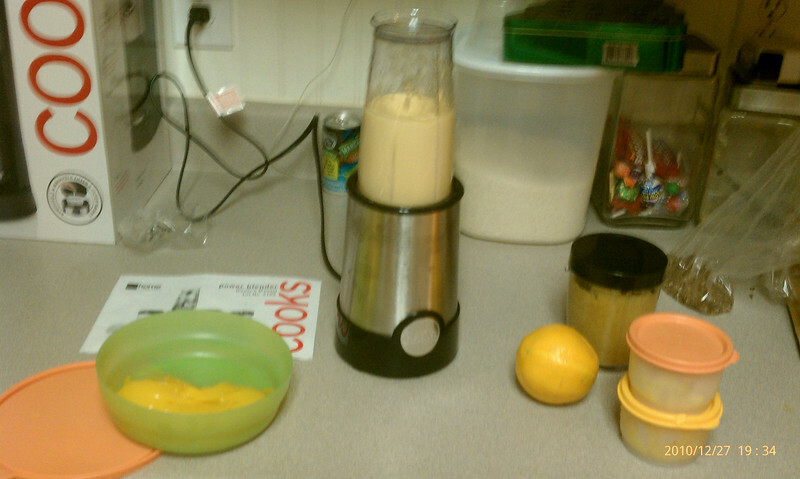 I blended up an orange minus the peal and some peaches and a bit of pineapple with some ice. It was tasty and filling. 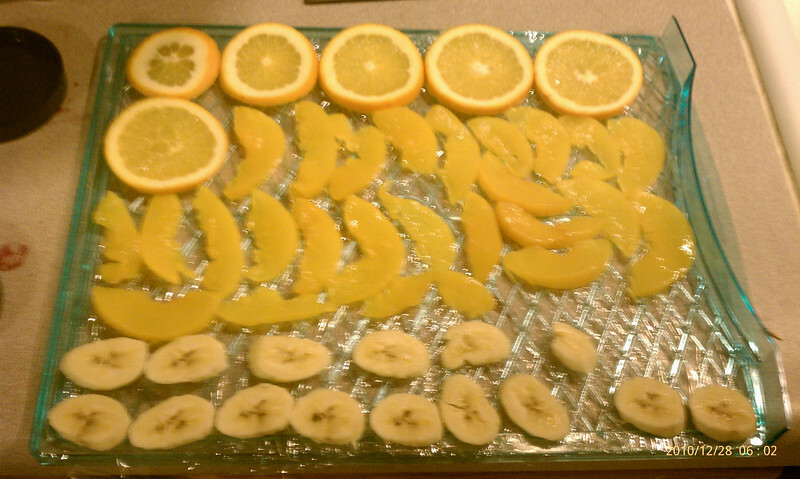 While drinking that I cut up thin slices of another orange, peaches and some banana then got it all laid out on a sheet for the dehydrator. 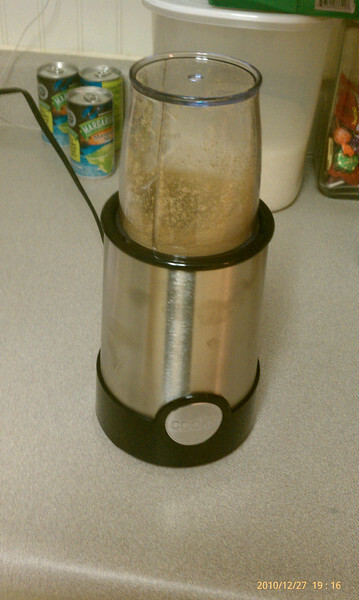 In the little blender thing I diced up some flax sead and added apple sauce and peaches in one jar. In another I did pineapple and apple sauce. 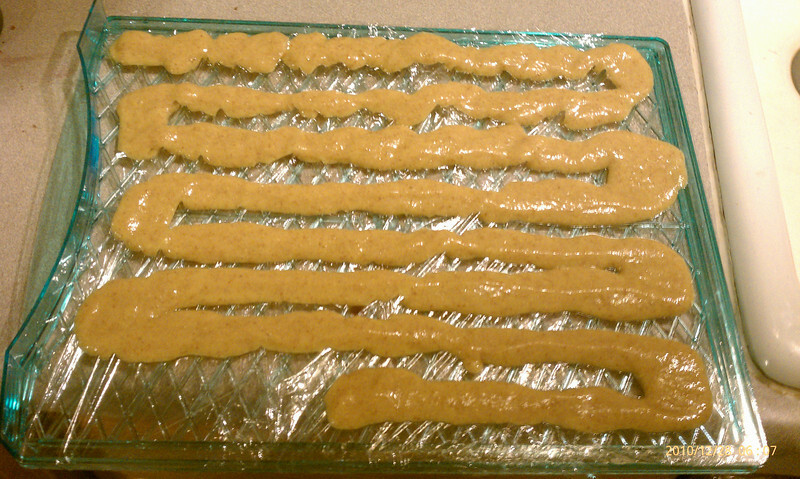 Then I poured these mixes onto sheets to make fruit leather or something like fruit roll ups I think. Actually some of this stuff I did this morning. It takes 4-6 hours for the fruit to dry and I didn’t want to get up in the middle of the night to check on it or unload it. 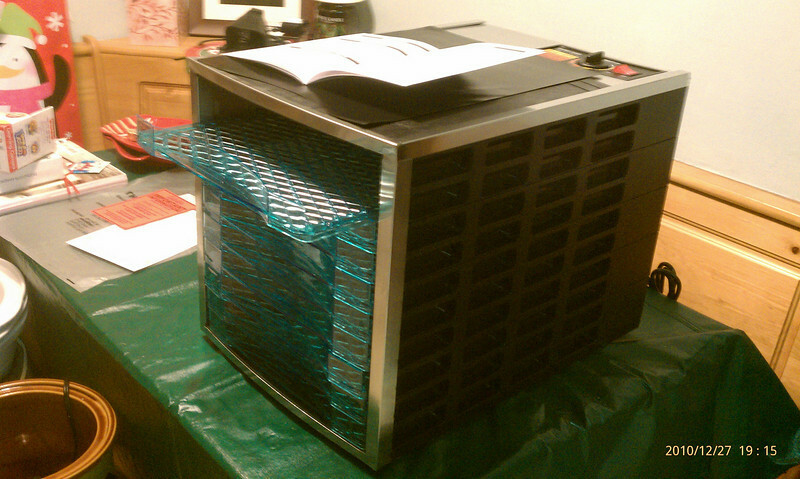 So this morning I loaded up my 3 treys into the dehydrator and got it going. This thing is a huge beast and seemed like I should have loaded a lot more but we were almost out of fruit and can only eat so much at once. I cleaned up the kitchen and put away everything then changed and went for a run. I listened to This American Life till Jon called then I talked to him and walked a ways. I got my replacement bolt for the van in the mail and it looks great. Jon and I decided to wait for a sunny day to put it in. Once home I got some gloves and a jacket and loaded up my truck with a big load of split wood. I hauled to the very back of the yard and added it to the stack. Then I came up and filled the bed again. The girls got home while I was working and I finished loading the truck then helped get Pumpkin in bed. Peanut comes home from his dad’s today and he has not been home since Santa came so we moved presents Santa brought to the tree and loaded up stockings. Our mantle is unfinished so I used some construction clamps to hold them up. Heath and I got ready for bed and called it a night. This morning I got the dehydrator going made some honey green tea and stacked the last of my split wood then came in to work. You could have thrown some of your deer steak in and made some jerky. The pineapple would have been good in there too. Glad you like your toy.